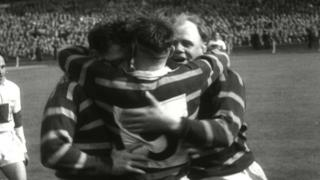 Legendary rugby league commentator Ray French remembers his first trip to Wembley for a Challenge Cup final. St Helens went into the 1953 final as strong favourites but Huddersfield, inspired by 19-year-old full-back Peter Ramsden, pulled off a shock 15-10 victory. Watch live coverage of Huddersfield v St Helens in the Challenge Cup fourth round on Sunday 6 April, from 13:45-16:30 on BBC Two/online.